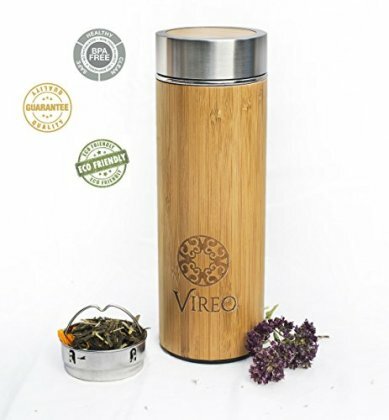 MOST STYLISH BEAUTIFUL AND DURABLE FLASK - Buy Vireo Portable Pitcher with confidence - 18/8 food grade steel known for its resistance to corrosion and staining, and antibacterial properties, it's odour free and perfectly suited for use as a beverage container. Tumbler is embraced with 100% natural bamboo. The nature bamboo can be harvested every year without any negative effects on the Planet, this makes you distinguished and Eco Intelligent. WIDE DRIP-FREE MOUTH WITH NON-LEAKING CAP -You won't find a stainless steel water bottle with a better design anywhere else online. Treat yourself to a product that actually WORKS and looks EXCLUSIVELY STYLISH! Our bottle is your ticket to a more pleasing lifestyle! LEAK AND SWEAT FREE - Just like the tankers you see driving on the highways, our 13.6 oz bottle has been specifically engineered to stay dry and not to leak. Stop worrying about liquids sweating in your bag or purse, our flask is the answer! HOT OR COLD INSIDE WHATEVER IS OUTSIDE - Our double-walled vacuum insulation technology keeps your drinks ice cold up to 24hrs and warm up to 12hrs. Enjoy cold beverages all day long at work, during those long events, or at the beach! THE BEST INSULATED BAMBOO WATER BOTTLE OR YOUR MONEY BACK - If our 100% Pure bamboo and 304 stainless steel water bottle (with NO plastic lining or dangerous BPAs) is NOT the BEST you've ever tried ... No questions asked, you can return your bottle at any time and for ANY reason, please contact us via email at any point! Save 10% on Best Buy Gift-Portable 13.6oz Fruit Pitcher for Home Office and Kitchen when you purchase 2 or more. Enter code 55TOHONF at checkout.